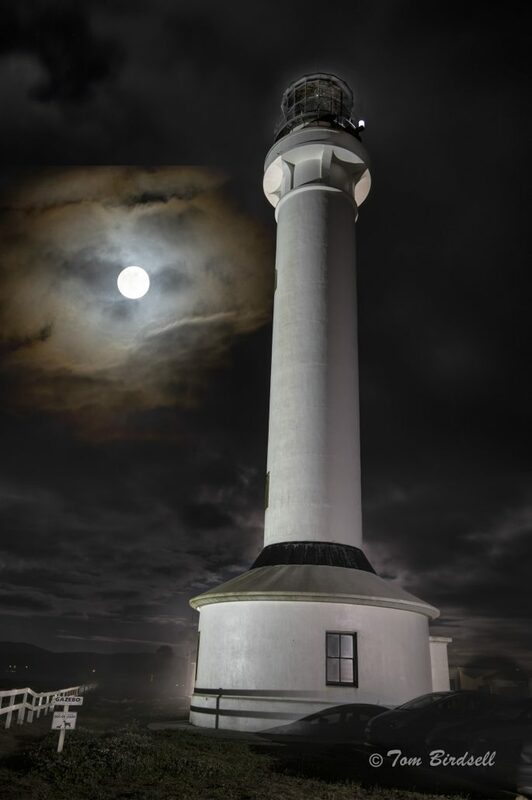 Come experience a spectacular night time view . . .
. . . from atop the Point Arena Lighthouse. Enjoy a panoramic view of the sea and coast from the lantern room at the top of the Tower, and if the weather cooperates it will be illuminated by the full moon! Our docents and guides will help you experience what it was like to be a Lighthouse Keeper and climb the Tower at night. They will guide you on your journey into the past and explain the unique history of this historic landmark, the tallest lighthouse on the West Coast. Champagne, sparkling juice and snacks will be served as part of the tour, and you get to take home an etched Point Arena Lighthouse champagne flute as a souvenir of this unique experience! Night Tours are scheduled on every full moon, with extra weekend tours added when the full moon falls within a day of Friday or Saturday. All proceeds go toward the support and maintenance of Lighthouse Tower, Museum and grounds. Point Arena Lighthouse Keepers, Inc. thank you for your generous support. Individual tickets are $30 each or tickets-for-two for $50. Cancellation policy: No refunds given if you cancel your reservation three days or less before the event. Tours are limited to a minimum of eight and a maximum of twenty people, and will be cancelled if less than eight sign up. You will receive a full refund if the event is cancelled. Please call our Reservation Desk at at 877-725-4448 ext. 1 or 707-882-2809 ext. 1 three days prior to the tour to confirm the event is happening as scheduled. According to the Old Farmer’s Almanac in Native American and early Colonial times the May Full Moon had different names depending on the community. It is typically known as the Full Flower Moon as it marked a time of increasing fertility, with temperatures warm enough for safely bearing young, a near end to late frosts, and plants in bloom. It is also called the Mother’s Moon, Milk Moon, and Corn Planting Moon. Gates open 8:30 p.m., Tour starts around 9 p.m.
Gates open 9 p.m., Tour starts around 9:30 p.m.
Gates open 7 p.m., Tour starts around 7:30 p.m.
Gates open 7:30 p.m., Tour starts around 8 p.m.
Gates open 6:30 p.m., Tour starts around 7 p.m.
Gates open 5 p.m., Tour starts around 5:30 p.m.